These distinguished guys have really tried for us, think of all those (ehrm) crunch-time moments that okadas have been lifesavers. There is a league of special (not necessarily) “gentlemen” that are typically known on Nigerian streets. After the Nigerian Police Force, they are most probably the most insulted. Oh wait I think PHCN should take second slot. Anyways. Each time I see them I am overwhelmed by their number. 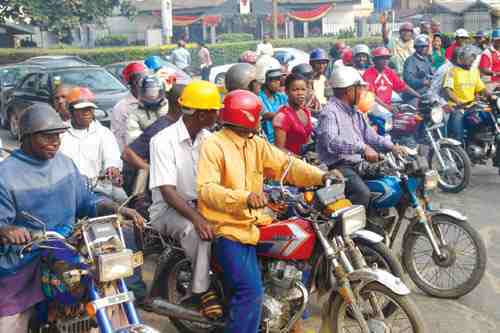 They are the Association of Commercial Motorcycle Riders, popularly known as okada men and the sight of them is usually accompanied by a quick onset of migraine. Lining up at the front row at any traffic light, smoke belching from their exhausts, they constantly rev their engines as if in preparation for a rally. They always look to me like they are completely oblivious of other cars or people on the road. They must think it’s their world. They are often seen in multi-hued rubber slippers and it is rather odd that many of them wear gloves despite the frightening Nigerian heat. I once asked why and the man I asked was quick to say he had no idea why others wore gloves but that he wore them to protect his palm from the friction that occurs between his bike handle and his palm. Genius, but still, hot. All manner of things are said about okadas especially in cities like Lagos and Ibadan. The most typical would be, “Oloshi ni awon olokada yen,” (bikers are never-do-wells). They are speed demons, competing with heavy duty trailers on the high way with stupefying bravado. They swerve dangerously in between cars and then deliver lectures to car drivers on road usage. Too many okada moment tales have been told—from getting tossed off the bike, to getting burned by the silencers, these bike riders cause a decent fraction of the accidents that happen on our roads. Problems notwithstanding, they do have their days o. Have you ever been late for an appointment or for any other reason at all? I tell you, these “oloshi’s” you’ve asked to be returned to their villages are your best bet. You may have been driving now for 15 years but you can’t beat what these guys do on the road. They beat any GPS system hands down. I was once in traffic with a lady and we both had a flight to catch. In frustration she got a bike, strapped her luggage behind her and zoom… the bike went off. 45 minutes later when I arrived (thank God flights almost always get delayed) she was checked in, calm, and chewing heartily at her biscuit, while I was sweating profusely from racing to the airport. What about those Monday mornings? These guys know all the shortest routes. You need description to a certain address? It’s okada to the rescue. There’s hardly a corner they don’t know and it seems they all know each other on first name basis. How strange is that? They even make small talk at traffic stop. You’ve gotta give it to these gentlemen, their solidarity is amazing. Like soldiers on wheels they organise themselves in no time. You dare not hit one of them. An “okada mob” will surround you in a split second. Even if you drive a Porsche, on that day they will not hesitate to put you in your place. Life is very difficult for most ppoele, some may be lack of plans but on the other hand, am pleading to our governments, let them pls help those that are suffering so that life will be some how easy for them. save this lives pls they are at risk of death. The topic of this post is something I have been stdiyung for some days now. I partly agree with you on the fact that banning Okada will amount to robbing some of their source of likelihood. But quite frankly they should be banned, but replaced with the tricycle called Keke-NAPEP. NAPEP is the National Poverty Eradication Program- so if the government is serious about this program, they will find a system of getting these Kekes into the hands of the Okada riders. Keke is safer to ride on the highway and it is far more comfortable. If they can implement this all over Nigeria, they would have killed two birds with one stone But does the government have the will to pull this off? Haa, Tope beams her searchlight on okadamen! I dont like them, and they dont like me either. I have a scar on my body to show for almost every attempt I have made to shuttle on an okada, and when I finally decided to avoid them like a plague that they are, I still got hit twice by them for no other offence than just walking on the road. And they still didnt leave me alone when I decided to stop treking, I have had to pay for the broken lights and mirrors of my dads car more than once because one okadaman or the other taught he could navigate the little space between me and the adjacent car. But credit to them, those guys sabi road. Nice one Sis, long may okadamen continue to occupy our highways. I was a very very big fan of okada.infact,b4 I tink of taking a cab,I'm on a bike already.the speed,the breeze on my face,its just awesome! !until I had a bike accident.still nursing my wounds. ah,since den,I've learnt to control it.no matter ow late I am,I use an alternative excpt I have no choice. Kudos to bikes though. Though many lives have been lost in okada accidents,it is an indisputable fact that many lives have also been rescued by okadas. Temitope,this is a good one.